It must, too, be said that, thanks to various addresses and insults Pope Francis has issued to 'kinds of clergy' and 'kinds of bishops', as well as 'kinds of Christians', Francis himself has done nothing to dispel this notion that he is good and the Church, moreover, is bad. Among those hard-working, often very holy priests will be a considerable number of canon lawyers who are trained in the detailed and nuanced laws of the Catholic Church concerning such issues as annulments. I'm not absolutely clear, having never sought an annulment, on the method by which annulments are issued or decreed, but I am aware that each Diocese has a tribunal process for such matters. One thing I fear, in this age in which the Pope is presented to 'the masses' as being a 'cut above' the rest of the Church in terms of humility, charity and mercy, or that rare 'breath of fresh air' that still sees him portrayed as what Austen Ivereigh calls 'The Great Reformer', is that, more and more this trend of Francis battling against the Church will keep focus on Francis himself, earning the Supreme Pontiff waves of mass popularity and general goodwill, while the Church, or, at least, the average priest, continues to be perceived as the notorious, stubborn enemy within society that simply won't learn to sing the new tune. You know, the 'rigorist' canon lawyer who won't just rubber-stamp your annulment because in his conscience he thinks it is genuinely valid, or the 'restorationist' who insists on reverence for the sacred liturgy. "Hi Father, I've bought you today's annulments post." One serious problem, as I see it, with the new motu proprio on annulments is that it removes from bishops and priests the ability to hide behind the law of the Church, to be anonymous, inserting far more subjective notions that could present ambiguity in terms of marriage validity. Such concepts as 'lack of faith' as a basis for an invalid marriage are just so nebulous that unless something much more detailed and concrete is produced to assist priests and bishops in this matter, faith - which, in terms of supernatural faith, let's face it, the Church has for 50 years become less and less insistent upon - validity of marriage is going to be completely in the eye of the beholder. It will become less and less clear as to how someone seeking an annulment of a marriage which, in the consciences of those conducting the tribunal, is valid, to be turned down. 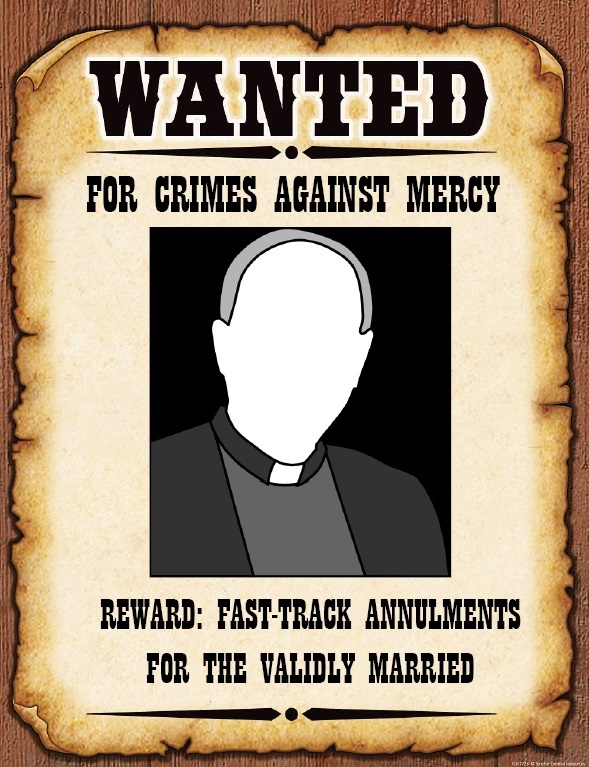 Indeed, in such cases, those who are refused annulments because priests and bishops trained in canon law who know what constitutes a valid marriage and what does not constitute a valid marriage could, perhaps will, go higher up in the Church authorities to seek the overturning of that decision by appeal. Step forward, then, the personal saviour, the all merciful, the most benign and humble figure of Pope Francis or his personally hand-picked team. Does that sound unlikely? It doesn't to me. Pope Francis has a habit of direct intervention into Diocesan life when he deems that something is awry. My opinion is that he also has a slight tendency towards micro-management. For evidence see the 'Bishop of Bling' media circus and other traditional bishops who have been taken out of action or down a peg or two by Pope Francis himself, while other more serious contenders for disciplinary action, rather than actually being disciplined, are instead invited to the Synod on the Family. In one way this measure is a 'distribution of papal power' to the Dioceses and to the Bishops (who will, if there are as many new annulments as the Pope wishes to see, simply have to delegate to priests). What if, as a canon lawyer and priest, or a bishop, you find that, in conscience, an appeal for an annulment does not pass the criteria for invalidity of marriage, despite what the claimant says? Is the decision of that priest or bishop or panel met with the respect that it deserves, or does the boss step in and haul the miscreants over the coals for not being merciful enough? One can almost imagine the Roman crowd giving a thumbs down to let the 'unmerciful' priest or bishop keep his position while Cardinal Maradiaga whispers into the Pope's ear to let the crowd have their way and have it divinely decreed by the Supreme Pontiff. When the laws of the Church are radically altered on a whim then it leaves a great many very vulnerable indeed, a great many married couples could be deceived and a great many priests and bishops could, because of a new subjectivism and a cult of personality, have their informed consciences over-ruled. What happens to that person or those people's vocations and place in the Church? 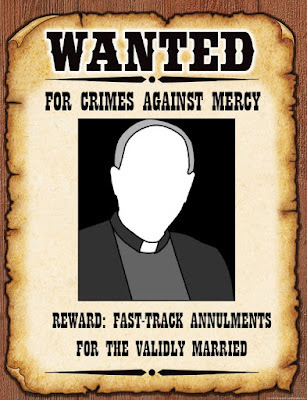 Will any priest or bishop, in this 'new springtime' of the Church pass the Pope Francis 'mercy' test, if he should dare to obey his conscience and say 'No' to an annulment claim despite the protestations of the person in the marriage assessed as valid by the tribunal? Will the Pope call the upset party who was refused the annulment over the phone and over-rule the decision by telephone? In other words, will it be Pope Francis saying, "The Church has spoken" in these cases, or will he simply say, "Come to Papa"? Will those Churchmen who refuse an annulment on perfectly reasonable grounds (traditionally speaking) maintain their status and dignity of office in the Church, or will they be shown some kind of door? For these reasons, as well as others, I find these developments deeply worrying. I shouldn't see a papal motu proprio as a kind of blue print for the public humiliation of priests and bishops following their consciences and obeying Jesus Christ but given the weekly homilies of Pope Francis, the soundbites, the image and the strange insults hurled in the direction of mostly straw men priests who don't fit Francis's image of the priesthood, I can't help seeing it as potentially just that. Pray for Francis, pray for the Church of Rome, pray for all bishops and clergy. You're quite right to be worried. I had a decree of nullity issued over twenty years ago and am now in a valid marriage. I was extremely reluctant to apply for it as I had heard that in some places they were 'given away like sweets'. After very carefully checking my diocesan tribunal was ok, I went ahead. If I was applying today, certainly after December, I don't think I'd go for it. I would rather remain alone for the rest of my life than have a fake annulment. That's how I felt then and even though I couldn't be more happily married, that's how I'd feel now. Unfortunately, too many people will not understand the dangers. "When the laws of the Church are radically altered on a whim then it leaves a great many very vulnerable indeed, a great many married couples could be deceived and a great many priests and bishops could, because of a new subjectivism and a cult of personality, have their informed consciences over-ruled." The good news is that His Holiness Pope Francis' reform of the annulment process was not based upon a whim. The opposite is true. Pope Francis announced his reform recently following a lengthy study of the annulment process by a Special Commission that Pope Francis approved in September 2014 A.D.
"The Holy See Press Office on Saturday announced Pope Francis has decided to establish a Special Commission for the study of the reform of the matrimonial processes in canon law. The decision was made on August 2, 2014. "This Committee will be chaired by Msgr. Pio Vito Pinto, Dean of the Roman Rota. The other members are: and will be composed of the following members: Cardinal Francesco Coccopalmerio, President of the Pontifical Council for Legislative Texts; Archbishop Luis Francisco Ladaria Ferrer, SJ, secretary of the Congregation for the Doctrine of the Faith; Bishop Dimitri Salachas, Apostolic Exarch of the Greek Byzantine Catholic Church; Msgrs. Maurice Monier, Leo Xavier Michael Arokiaraj and Alejandro W. Bunge, Prelate Auditors of the Tribunal of the Roman Rota; the Rev. Fr. Nikolaus Schöch, O.F.M., Substitute Promotor of Justice of the Supreme Tribunal of the Apostolic Signatura; Fr. Konštanc Miroslav Adam, O.P., Rector of the Pontifical University of Saint Thomas Aquinas (Angelicum); Fr. Jorge Horta Espinoza, O.F.M., Dean of the Faculty of Canon Law of the Pontifical University Antoniamum; and Prof. Paolo Moneta, formerly professor of Canon Law at the University of Pisa." Far from having been based upon a whim, His Holiness Pope Francis' reform of the annulment process was based upon a nearly one-year in-depth study of said process. Climate change,climate change ...!! !These were the first things that that man said in the USA.God Help us! I am not worried though.The messages of Our Lady of Fatima and Our Lady of Akita -these are manifest today in this man.She will crush satans head ,not that man visiting the USA.God Bless. In a similar vein, I wonder what will happen to couples who have had their annulment requests denied, but under these rules would qualify. Do they get to come to Papa? Doesn't seem very "merciful" not to do something for them. The whole thing is more like a joke; rather than an increase in annulments, expect to see a further decline in marriage. It is worse than you think actually. There are abuses already in tribunals with marriages being declared invalid, then being sent to the Roman Rota where the judgment is overturned. 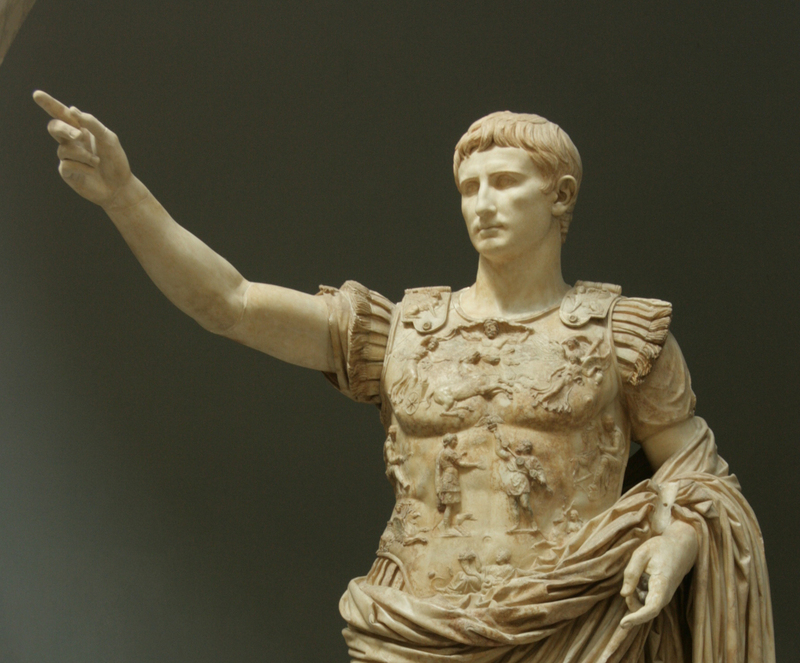 In fact, if you check the statistics, somewhere around 92% of the nullity decrees from the U.S. are overturned on appeal in the Roman Rota. The burden of proof is supposed to be on the spouse that wants the marriage proven null, but often the tribunals judge in their favor in the name of "mercy." Fr. Gerald Murray, a canon lawyer, has written a post on "The Catholic Thing" blog entitled "Scrap the New Annulment Process". He has looked at the annulment process through the lens of canon law, and discussed it with other canonists...and the result is his recommendation that it should be scrapped. I thought the same thing, Despot. The small few who were denied an annulment will reapply---probably under the 'lack of faith' reason. But worse, as Catholics see this rubber stamp process become more commonplace and so easy to obtain, many may start to bypass the process altogether and just present themselves for Communion. The annulment application will just be seen as a little extra step that only more scrupulous Catholics seek out. I work in a conservative Novus Ordo parish (but no longer take the sacraments there) and I know of both a Eucharistic minister and a psalmist who are divorced and civilly re-married and neither have ever "felt the need" to get an annulment. I believe the numbers of people like this will swell as annulments become even easier to obtain. Well said - quite agree. Interesting how mercy becomes meaningless in the mouth of a Modernist. Happily the unhewn rock of the universal Church is not the domain of Protestant sculptors past or present. Viterb--- who comprises the hierarchical sextet? Time will tell as to whether His Holiness Pope Francis' reform of the annulment process will benefit the Church. "X" number of months or a year or two from now, we will have an idea as to the above. Until then, the fact remains that via a special commission of canon law experts and theologians, Pope Francis had taken nearly one year (plus his many years as a priest) to arrive at the annulment process reforms that he enacted. Again, it won't be too long before we learn as to who (Pope Francis or his critics) is correct in regard to the annulment process reform. I had said..."Pope Francis had taken nearly one year (plus his many years as a priest).,." My meaning is that his many years as a priest (Bishop, Archbishop, and Cardinal) acquainted him with the good and bad, at least as he saw things, with the annulment process. I believe that His Holiness acted in good faith when he announced his reforms in question. Certain of his critics have claimed that the reforms in question are meant to weaken the Sacrament of Holy Matrimony. I reject that notion. But again, time will tell as to whether the Pope's reform of the annulment process proved effective.